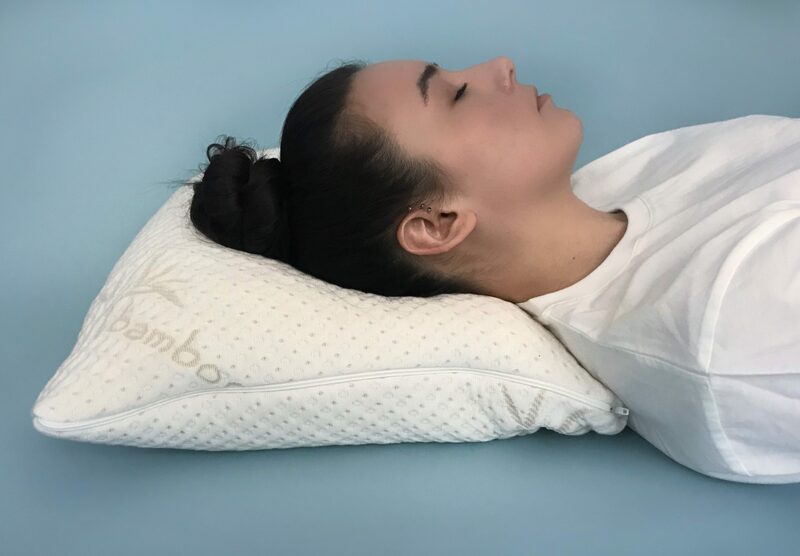 The Snuggle-Pedic pillow features an adjustable design and a cooling cover option with a shredded memory foam interior. 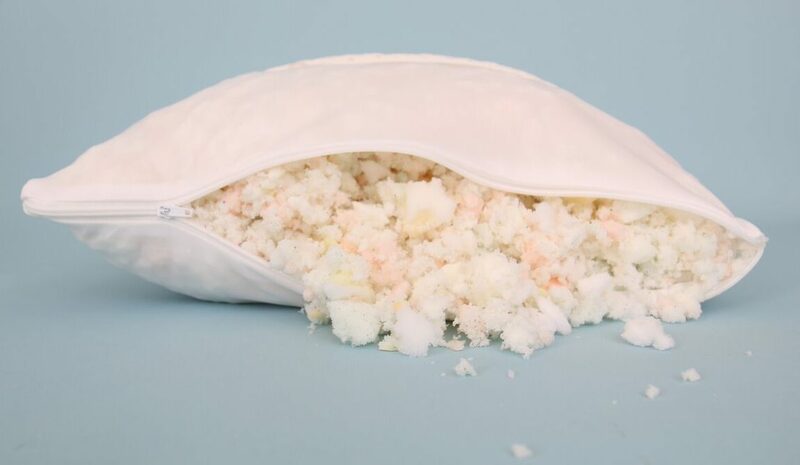 Although, the adjustability of the Snuggle-Pedic isn’t exactly customer friendly… If you want to decrease the loft you will have to remove the shredded bits of foam and save them for later if you wish to refill whereas other adjustable pillows have removable internal layers. The removable cover is a bamboo blend making it soft, durable, and breathable. It zips off from the inner core layer for easy cleanings and the core layer has a zipper of its own for removing the foam fill. The Snuggle-Pedic pillow is very dense and has a firm, supportive feel. Its shredded foam interior is made with Biogreen memory foam and CertiPUR-US memory foams which means they are rigorously tested to ensure safety for both you and the environment. Because memory foam has a lot of internal friction causing it to sick to itself, the shredded foam interior tends to lump together. This means it will need a few adjustments before it feels just right for your body and sleeping position, and may need some more adjustments throughout the night. Adjust the crushed memory foam fill to your desired height by removing the bits of foam from the core layer. Because our testers head sits slightly elevated beyond a neutral position she would need to remove additional filling. The Snuggle-Pedic pillow is a dense mix of crushed memory foams making it great at absorbing the 10 pound weight. When the weight is placed the pillow surface is not effected much and reforms soon after. For sleepers that prefers a firm, supportive pillow the Snuggle-Pedic definitely hits those marks. Because the filling is crushed memory foam it does tend to lump together and may need continual readjusting. 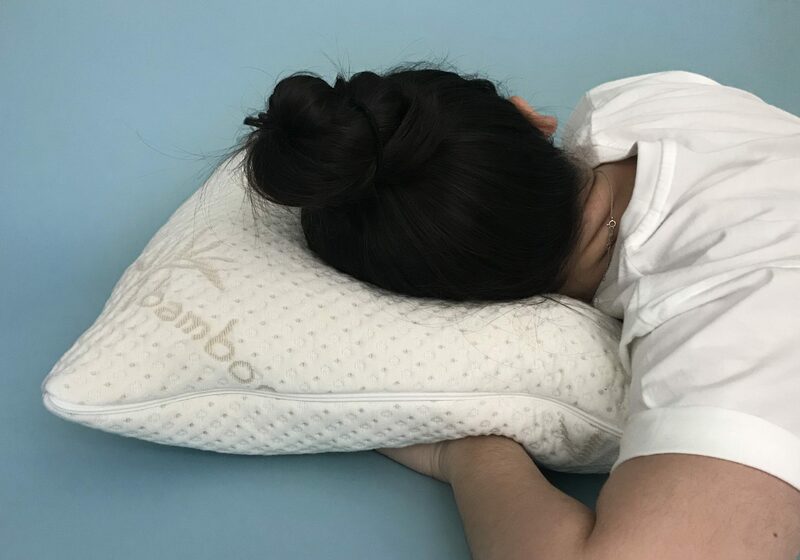 The Snuggle-Pedic pillow features a bamboo blend cover which helps keep you cool at night. Although, the pillow performed averagely in our thermal hand test. For the infrared test a hand was placed on the Snuggle-Pedic pillow for one minute and off for one minute. After the hand was removed the highest recorded pillow temperature was 86° which dropped to 77°. The Snuggle-Pedic pillow features an adjustable design making it a great option for many sleepers. 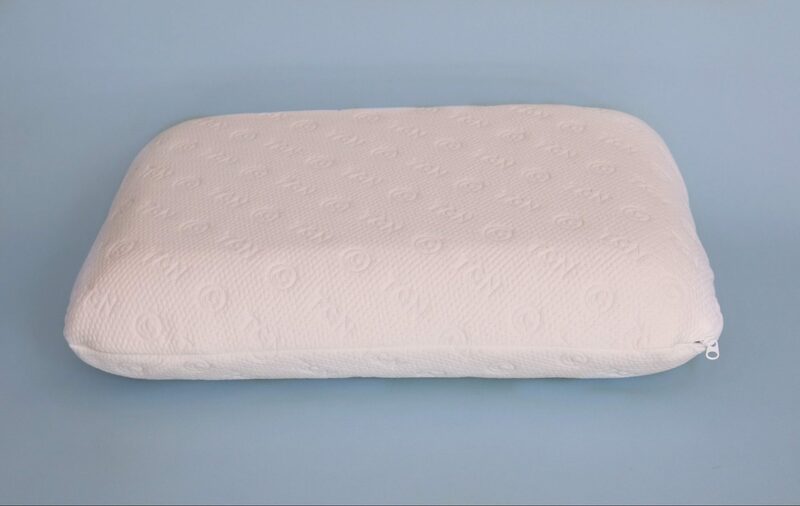 By removing or inserting the crushed memory foam fill this pillow may be a good fit for sleepers of all positions. 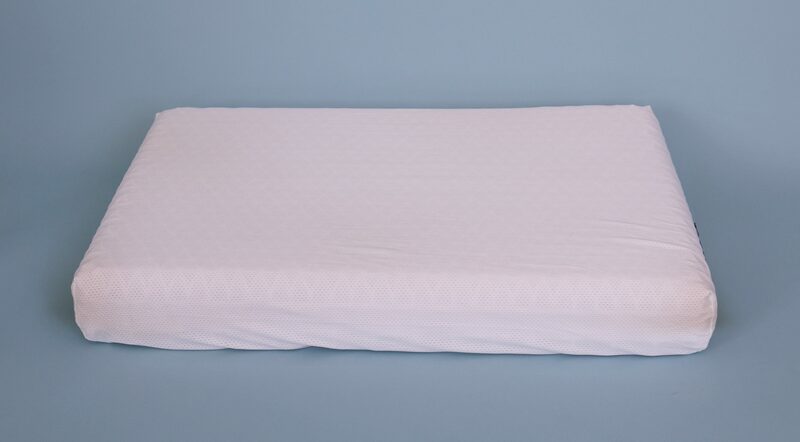 The Tuft & Needle pillow features their T&N Adaptive Foam™ with the density adjusted for ideal pillow comfort. Plus the foam is blended with graphite for added cooling. The Tencel fiber covering is soft, breathable, and hypoallergenic. The zipper cover is removable for easy washing, too but must be air dried to avoid pilling. Though the Tuft & Needle pillow is one piece of foam it does have a soft and airy feel. The airflow channels running through make it lighter and more flexible than other solid foam pillows. 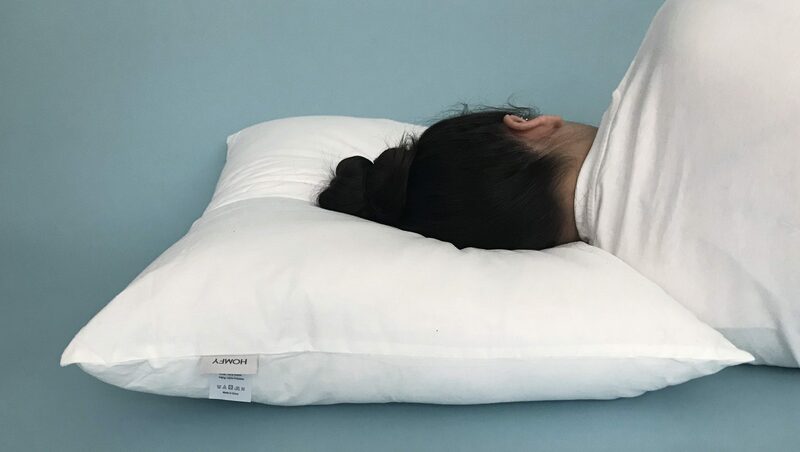 Even though the pillow is one piece it is soft enough to be easily manipulated into different positions while still providing a decent amount of support. The Tuft & Needle pillow is 6″ in height. It has a soft but supportive feel that could be a great fit for side and back sleepers. Though, this pillow may be too tall for stomach sleepers. 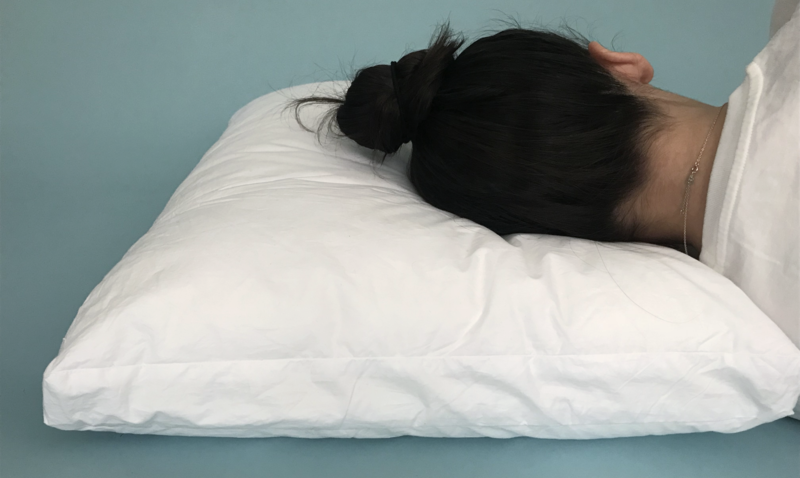 For our tester, the T&N pillow would be well suited in the side sleeping position but her head is elevated past neutral in back and stomach positions. The T&N Adaptive Foam™ is just that. Adaptive. 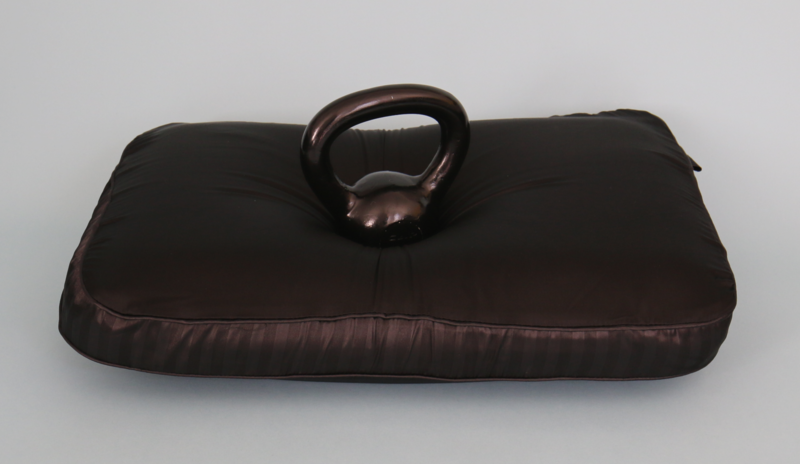 It bounces back immediately when the weight is removed and has a soft, bouncy feel. The weight didn’t effect the surround surface of the pillow when it is placed and removed. If you prefer and soft pillow but need something that doesn’t buckle under your head at night, the Tuft & Needle pillow may be a good match. 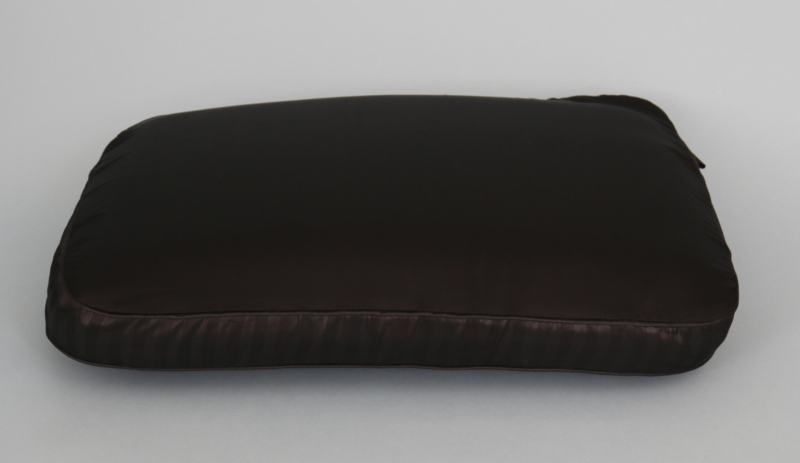 The Tuft & Needle pillows’ T&N Adaptive Foam™ is made with graphite to keep you cool. And, it does actually stay cool. 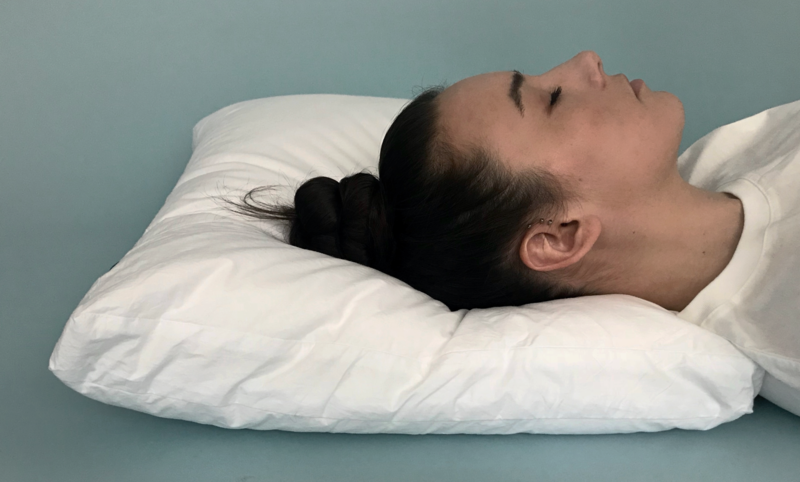 After the hand was removed the highest recorded pillow temperature was 88° which dropped to 75° which is 2° cooler than similar foam core pillows we’ve tested. For the infrared test a hand was placed on the Tuft & Needle pillow for one minute and off for one minute. 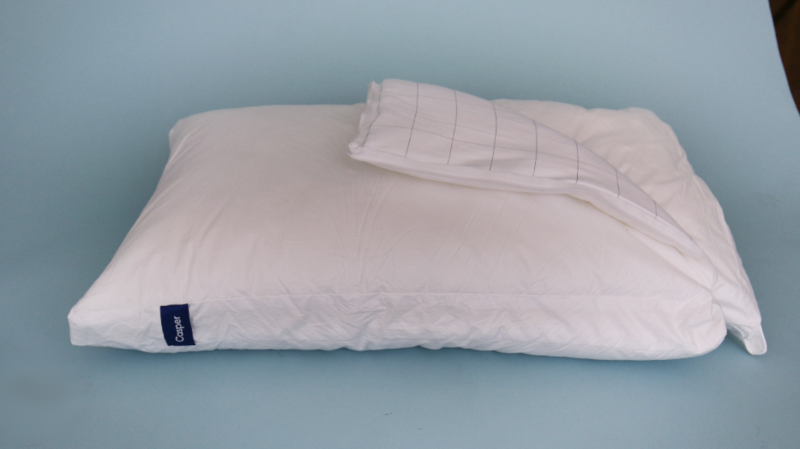 Overall the Tuft & Needle pillow performed well and was very comfortable. The cover does have a tendency to pill so keep that in mind. If you are a back or side sleeper and prefer a soft, reactive pillow the Tuft & Needle may be a good fit. 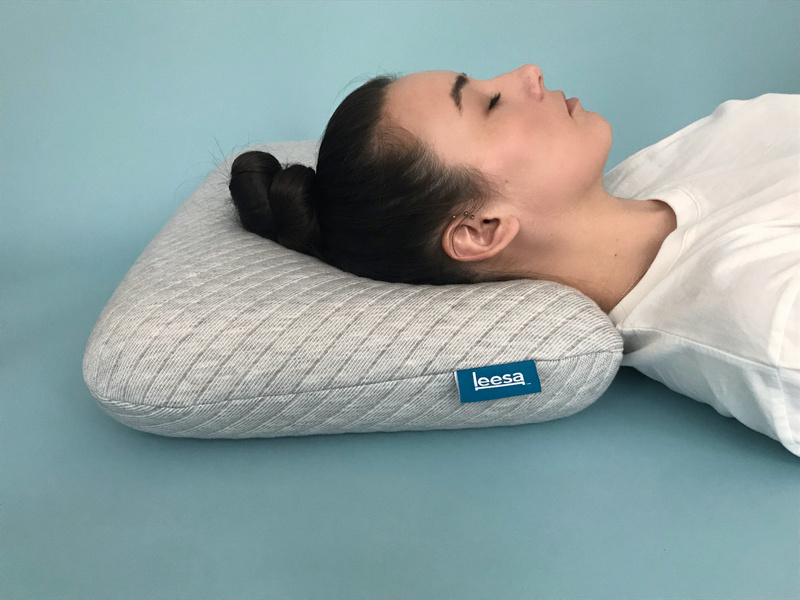 After years of development and hundreds of prototypes Leesa believes they’ve designed a pillow that always feels perfect. 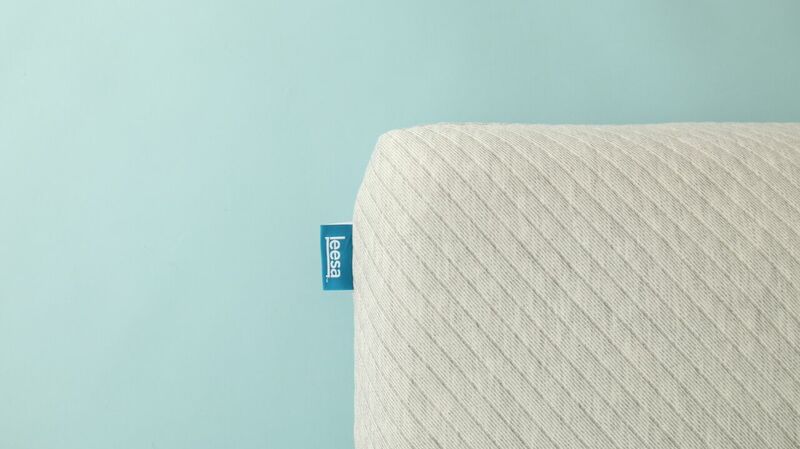 Like the Leesa mattress, the pillow features specially formulated Avena foam which has hundreds of ventilation channels for improved airflow and support. Leesa tweaked the Avena foam formula with-head cradling comfort in mind for your best nights sleep. Plus, it is all wrapped up in the knit Leesa cover which can be removed for easy cleaning. The Leesa pillow features their signature Avena foam which can also be found in the top layer of the Leesa mattress. Avena foam has a feel similar to latex and is much springier than its memory foam counterpart. Hundreds of ventilation channels allow for added airflow and optimal weight distribution. It has a soft but supportive feel and would be a good match for someone who prefers a soft pillow with low loft. 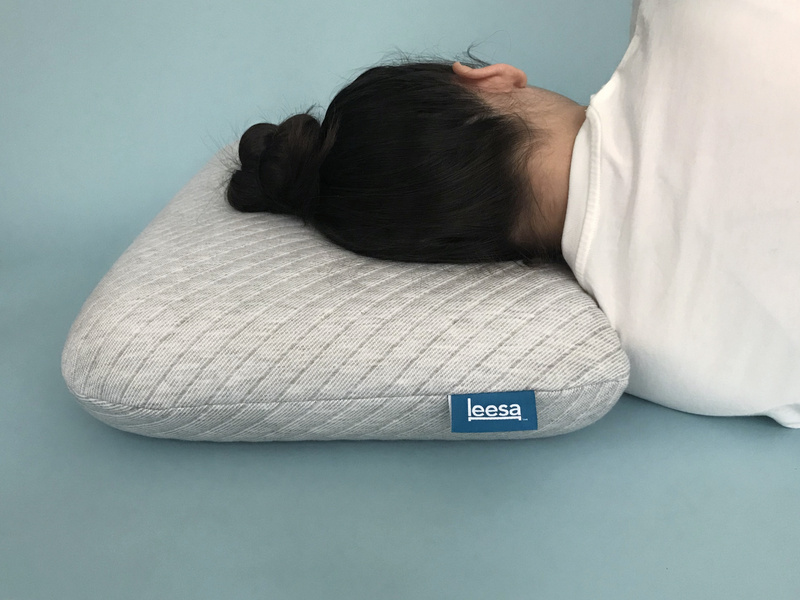 The Leesa pillow was most comfortable in the back and side sleeping position for our tester but was slightly too high for comfortable stomach sleeping. With a loft of 5″ the Leesa pillow may work well for many sleepers in back, side, or stomach sleeping positions. The Leesa pillow is super bouncy and springs back immediately once the weight is lifted. 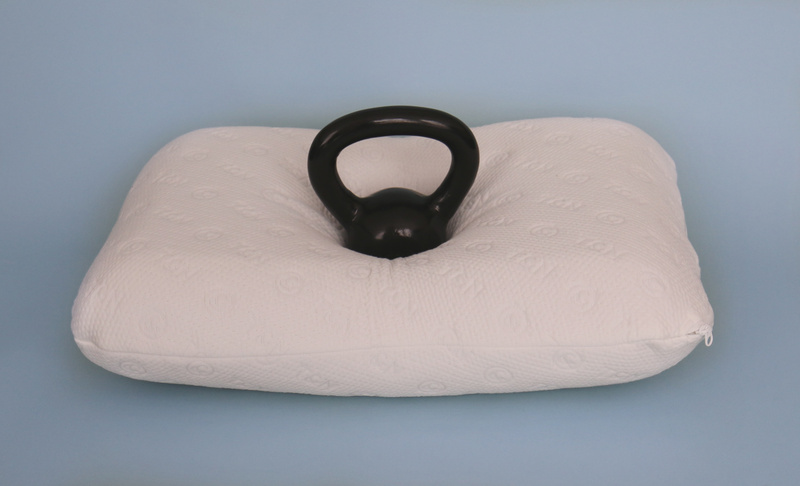 You can see below just how bouncy the Leesa pillow is when the weight is placed. It is highly reactive and will provide contouring support in back, side, and stomach sleeping positions. The average head weighs 10 pounds. See our 10 pound kettlebell test below. 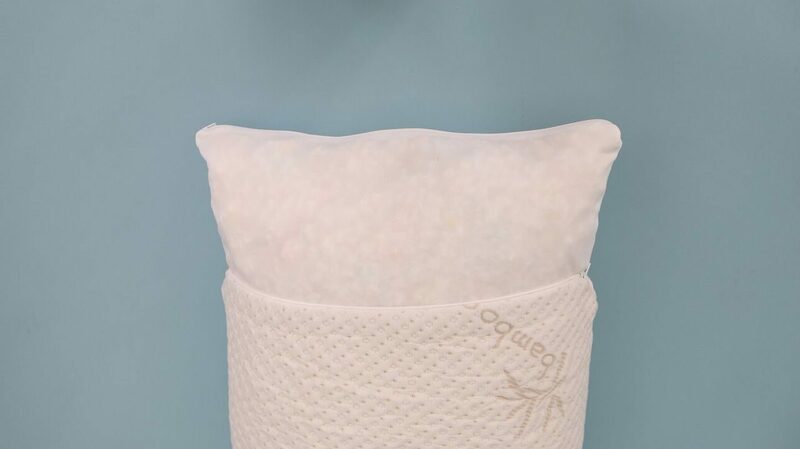 The Leesa pillow performed averagely in our thermal hand test. Like latex, the Avena foam interior does tend to hold heat in. Plus, the knit outer cover acts as a sweater for your pillow holding in some added heat. After the hand was removed the highest recorded pillow temperature was 88° which dropped to 77°. The Leesa pillow stayed 1° to 2° hotter than other pillows we’ve tested. For the infrared test a hand was placed on the Leesa pillow for one minute and off for one minute. The Leesa pillow has a low loft of 5 inches making it an option for stomach sleepers as well as back and side sleepers. The Casper Pillow is made with no foam and no down. Instead, each Casper pillow is filled with nearly a billion coated fibers. The pillow features a dual-layer design with a thin outer layer of long, thin, fibers, and the inner layer is filled with short, thin fibers. This fill is supposed to prevent clumping and give it a bouncier feel. 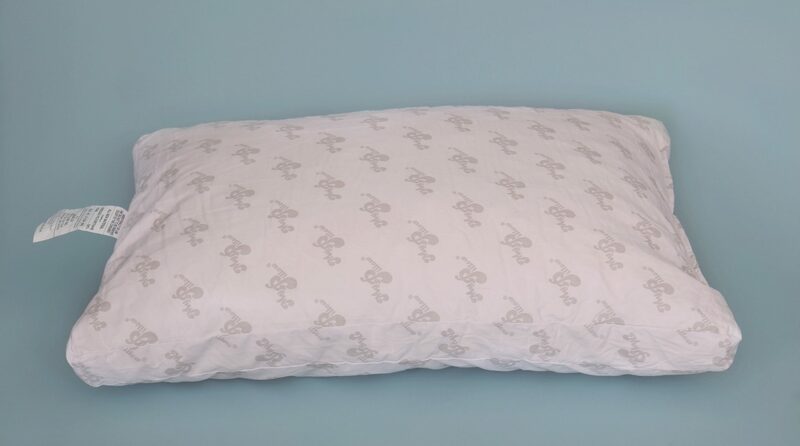 The pillow cover is 100% cotton cover with a breathable percale weave giving it a crisp feeling. To wash just remove the outer cover, zip it back up, and toss in the washer, then tumble dry on low. The Casper pillow has a soft feel and isn’t exceptionally supportive. It does cradle your head and neck but it doesn’t feel like much is there to align your spine. The loft may be too high for stomach or side sleepers so keep that in mind if you are of small to medium build. 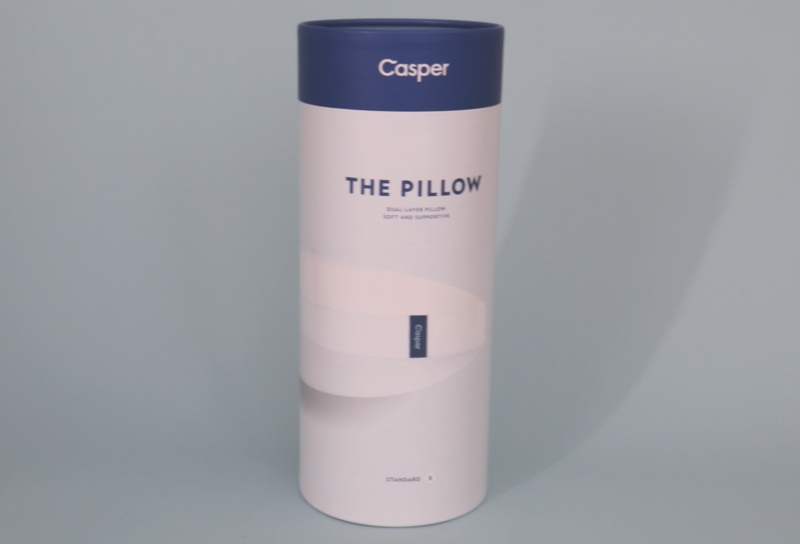 Overall the Casper pillow is soft and cozy but may not provide enough support to wake up pain free in the morning. The Casper pillow is very soft, so the 10 pound weight sunk deeply, 4 inches. Leaving three inches of loft surrounding. Because it’s made with synthetic coated fiber which bounced back fairly quickly. If you’re looking for a supportive pillow the Casper may not make the cut. It buckled under the 10 pound weight with an indentation of 4 inches. Surprisingly, the synthetic fibers of the Casper pillow released heat quickly during the infrared test. After the hand was removed the highest recorded pillow temperature was 88° which dropped to 75°. For the infrared test a hand was placed on the Casper Pillow for one minute and off for one minute. Sped up at 3x. The Casper pillow has a super soft feel and high loft. 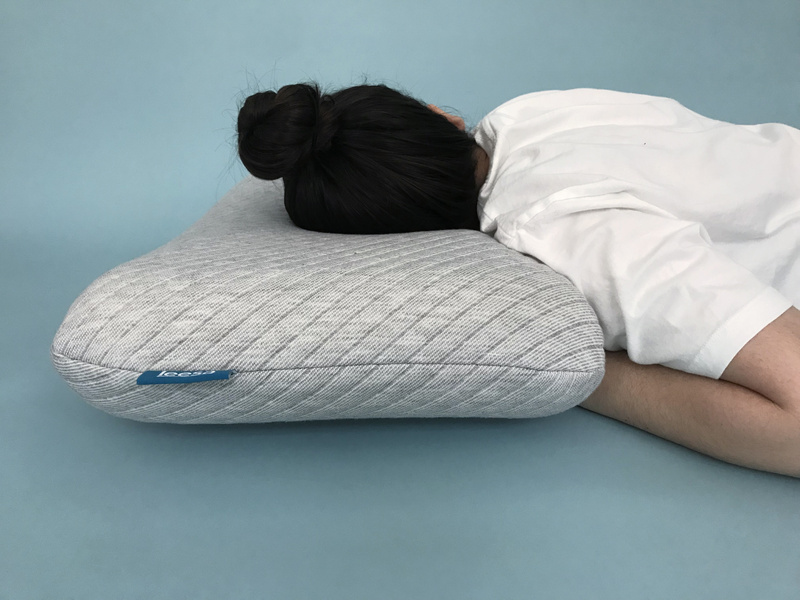 The Casper would be a good match for back and side sleepers who like a soft pillow but because of its loft the Casper may not be suited for stomach sleepers. Featuring its eccentric founder, the MyPillow is heavily advertised on television channels across the US. MyPillow’s patented interlocking fill allows you to adjust the loft just by fluffing. It features a cotton cover and 100% shredded polyurethane foam interior. MyPillow guarantees it will be “the most comfortable pillow you’ll ever own. Though, there is no zipper or removable cover for washing or adjusting the fill level internally. The entire pillow is machine washable and dryer safe. The interlocking foam interior gives the MyPillow a lumpy feeling. 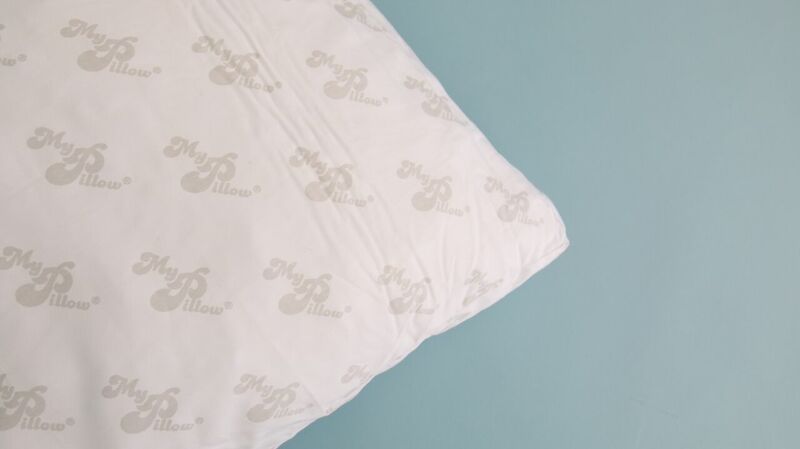 The MyPillows’ adjustable polyurethane foam interior allows you to fluff and adjust to fit your needs. When fluffing, the loose pieces of polyurethane foam stick together to increase the loft. To decrease loft, shake the pillow out to separate the foam pieces. 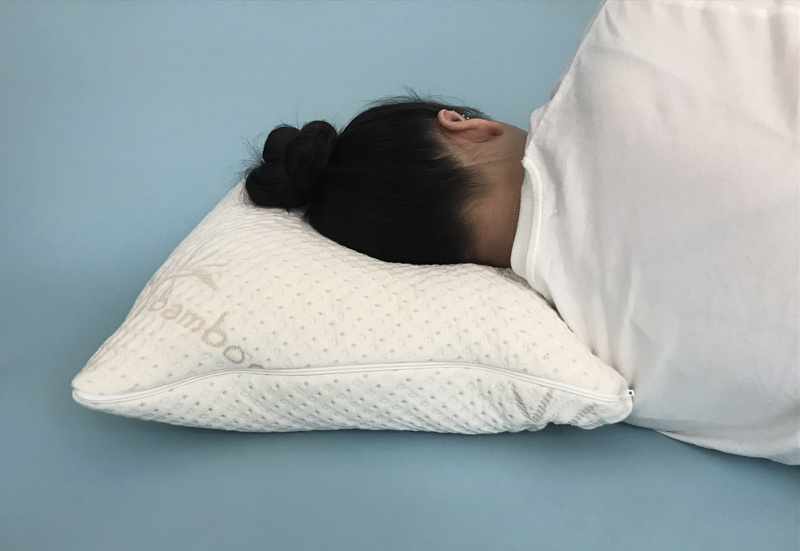 A plus for the MyPillow is that it can be easily manipulated fit your sleeping position or desired comfort level. Conversely, if you don’t like adjusting your pillow between each position the MyPillow may not be a good fit. 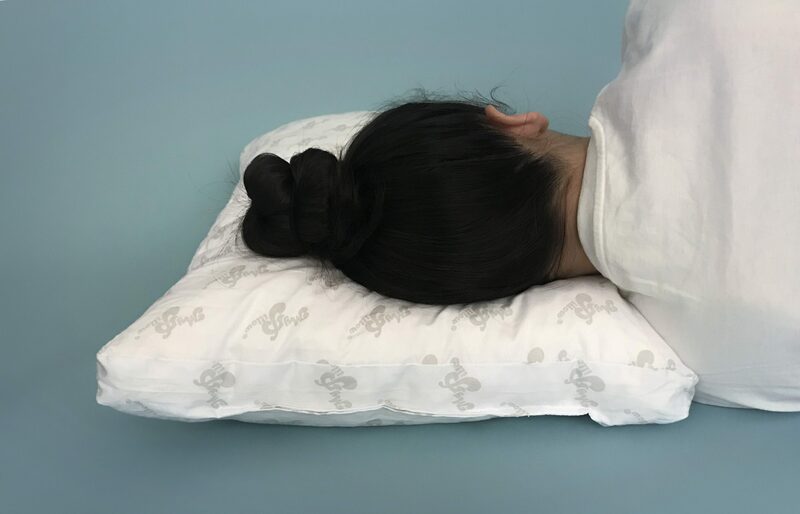 For our tester, the MyPillow will work for back and side sleeping but her head is slightly elevated past the neutral resting position when sleeping on her stomach. 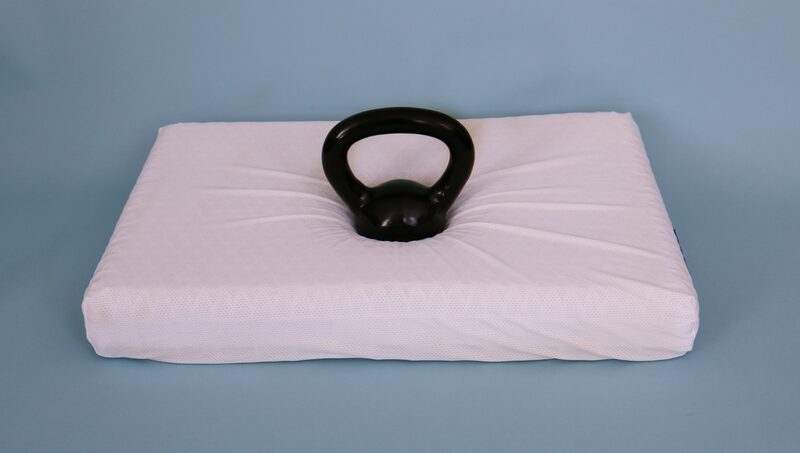 The 10 pound weight causes the surrounding surface of the MyPillow buckles. The interlocking polyfoam filling does not support the weight well, and doesn’t bounce back fully after the weight is removed. Although, it can easily be manually fluffed to regain its original shape. When you lay your head down the pillow will conform around you. The MyPillow is one of the coolest pillows we’ve tested. The interlocking polyfoam fill allows for more airflow than memory foam pillows. If you’re flipping over to the cool side of the pillow all night the MyPillow may help keep you cool. The 100% cotton cover also allows heat dissipate quickly. A hand was placed on the MyPillow for one minute and off for one minute. Sped up at 3x. Once the hand was removed the highest recorded pillow temperature was 86° which dropped to 75°. For the cost, there are much better options out there than the MyPillow. There is a sparse amount of interlocking fill that makes the MyPillow feel lumpy and cheap. The Night pillow cover is 95% mulberry silk and 5% spandex, whereas the pillow itself has a solid, 100% memory foam core. The silk cover of the Night pillow is meant to be slept on by itself. This cover is gentle on the skin and hair, and the black color is to draw light away from your eyes. For cleaning just wash and tumble dry on low. 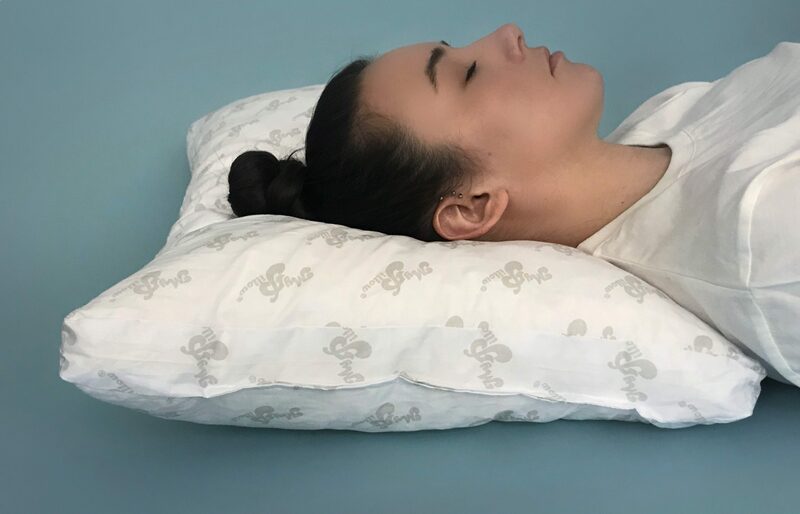 With a loft of 5″ the Night pillow elevates the testers head above neutral in back and stomach sleeping positions. 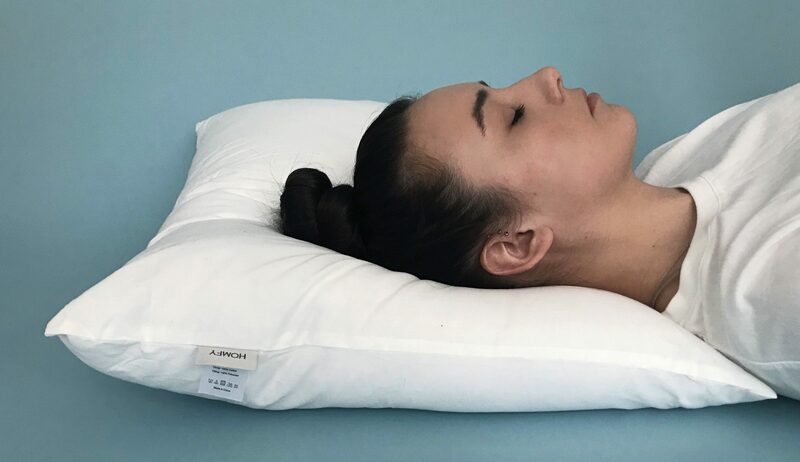 The Night pillow holds the testers head at a neutral position in the side sleeping position. Because the Night pillow cover is made of mostly silk it is fairly slippery. Our tester noted that it felt like her head was slipping off as she was resting on it. The memory foam was also very firm but should soften up over time. If you are looking for a memory foam core pillow, plus want to take better care of your skin the Night pillow may be a good option for you. 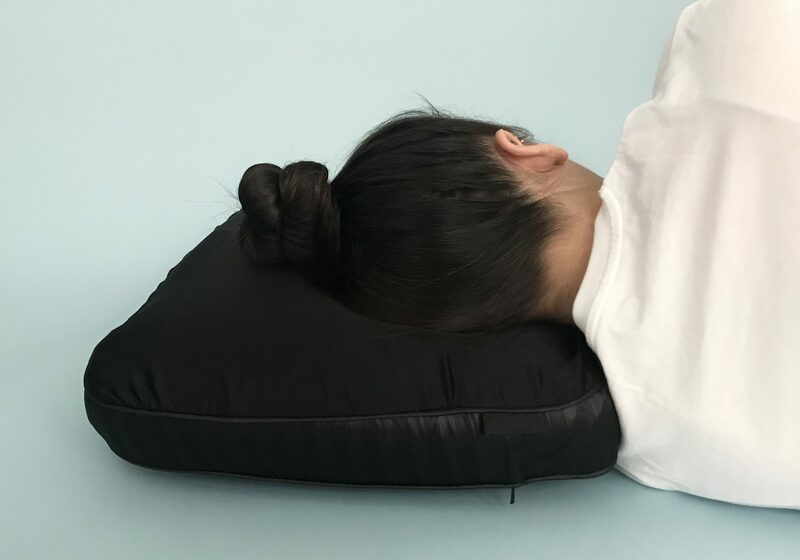 The Night pillow is one solid piece of memory foam which is deeply contouring when pressure is applied. Though the silk spandex cover bounces back immediately as you can see in the test below. 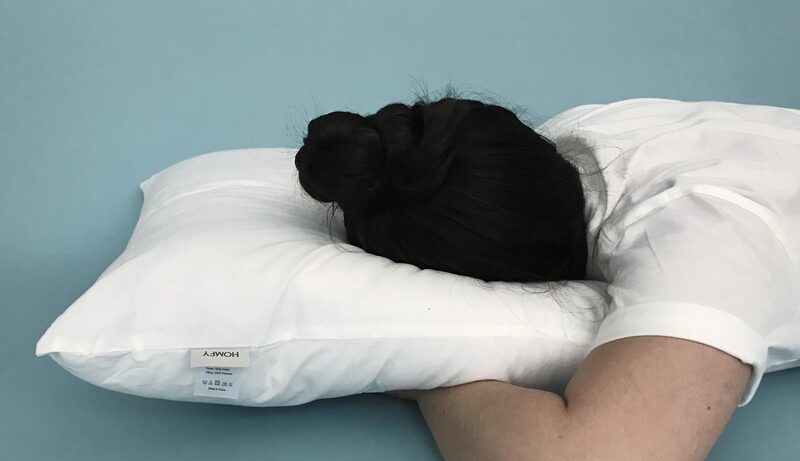 If you need a super supportive pillow the Night will keep your head and neck in place while you sleep. The memory foam absorbs the weight and it doesn’t effect the surrounding pillow surface. Traditionally, memory foam is known to get hot at night and that’s just what happened in our infrared test. Though, the silk blend cover is cool to the touch so when you get hot just roll to the other side for an instant cool down. After the hand was removed the highest recorded pillow temperature was 88° which dropped to 79°. It remained 2° hotter on average. For the infrared test a hand was placed on the Night pillow for one minute and off for one minute. 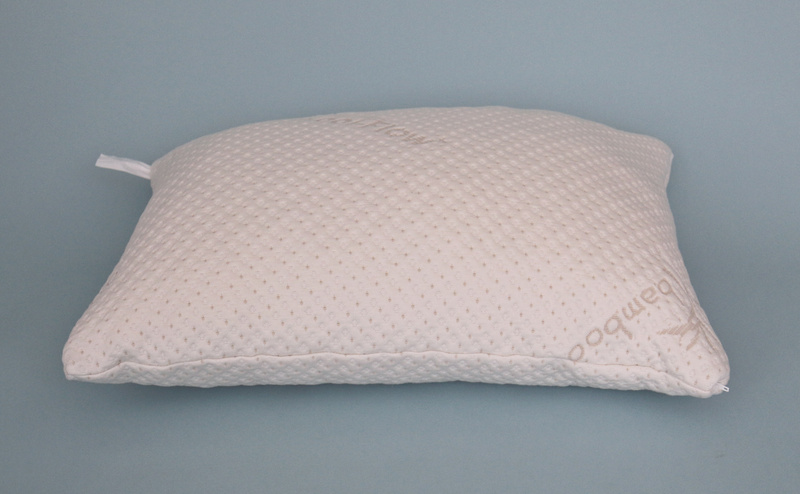 For sleeper sleepers that love a firm memory foam pillow, the Night Pillow may be their match. Although, the $150 price tag is steep. 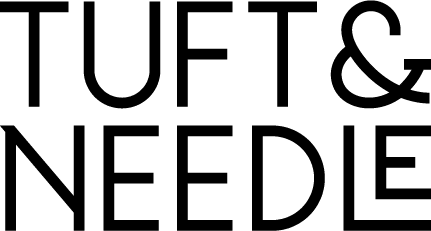 If $150 is out of your price range, a memory foam pillow and silk pillowcase can be purchased separately at a much lower cost to achieve, essentially, the same result. 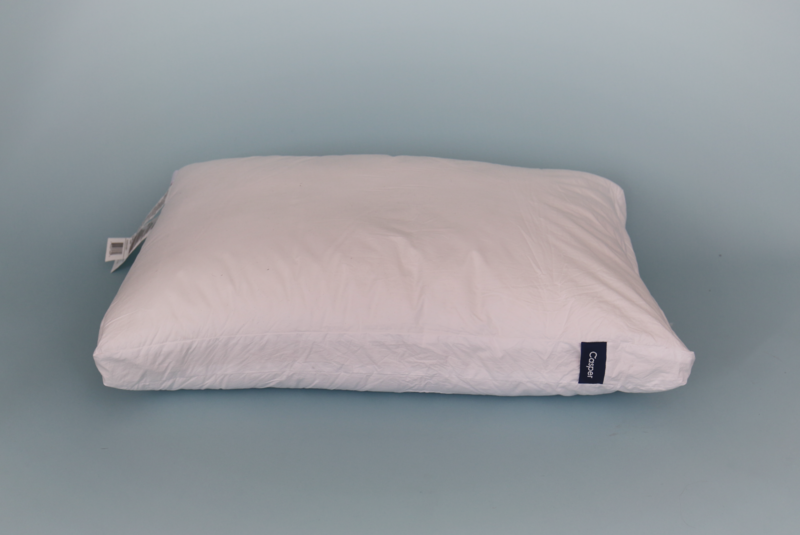 The Homfy pillow is made with organic cotton and is hypoallergenic. They come as a set of two and are thin in loft. If you prefer a taller pillow, the pillows could fit together in a pillow case to increase the loft if necessary. The Homfy pillow has a soft cotton weave cover and fluffed cotton interior. Keep in mind that the Homfy pillow is not very structured or supportive. 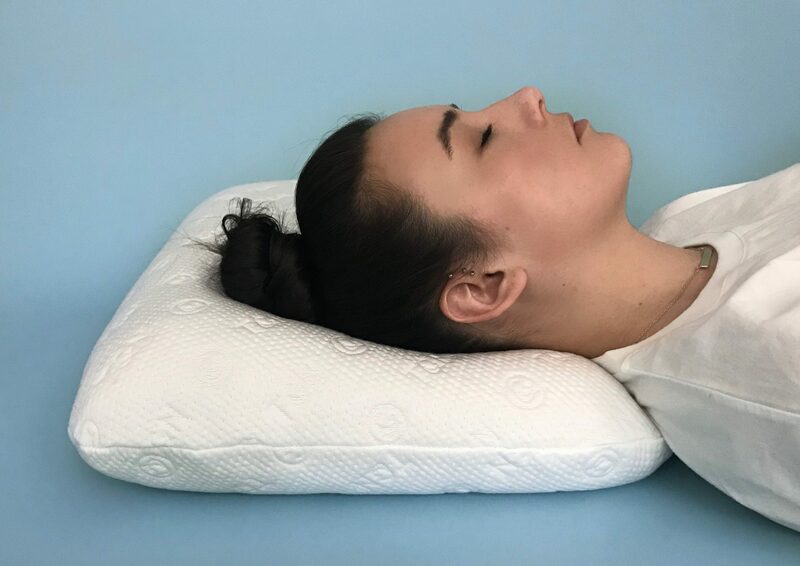 The pillow bottoms out under the weight of the testers head and doesn’t provide much, if any, support to her head and neck. Also, the fluffed cotton interior feels like it may lump together over some use. The Homfy pillow would be best suited for stomach sleepers, or sleepers who prefer a very thin and soft pillow. The Homfy pillows do come in a set of two for only $39.99 which make them great throw pillows for a guest bed or as decorative pillows. The Homfy pillow is made of organic cotton which has a lot of give. The 10 pound weight compressed the pillow by 3 inches and bounce back quickly after it was removed. As you can see below the Homfy pillow doesn’t provide much support as the 10 pound weight bottoms it out right away. Though the Homfy pillow is 100% cotton which does hold on to heat during our infrared test. After the hand was removed the highest recorded pillow temperature was 86° which dropped to 77°. If you sleep hot you may find yourself flipping the Homfy pillow all night long. For the infrared test a hand was placed on the Homfy pillow for one minute and off for one minute. 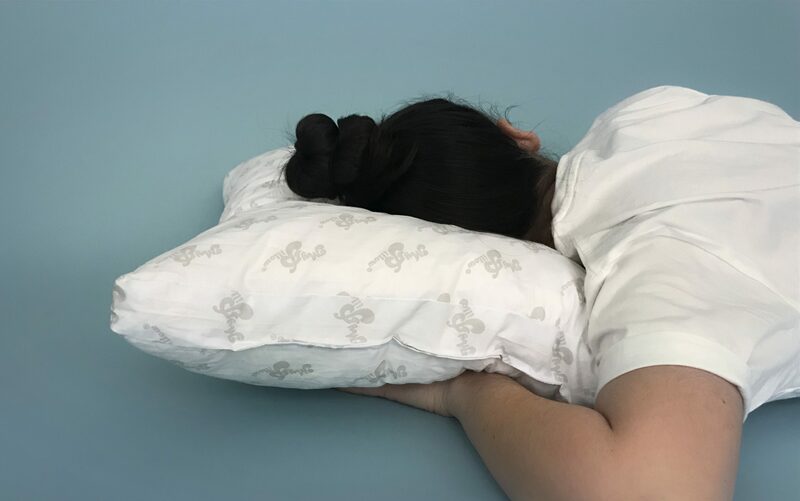 The Homfy pillow may not make a great everyday pillow because the soft cotton interior will clump together after some use. It may be better suited as a throw pillow or a filler on a guest bed. 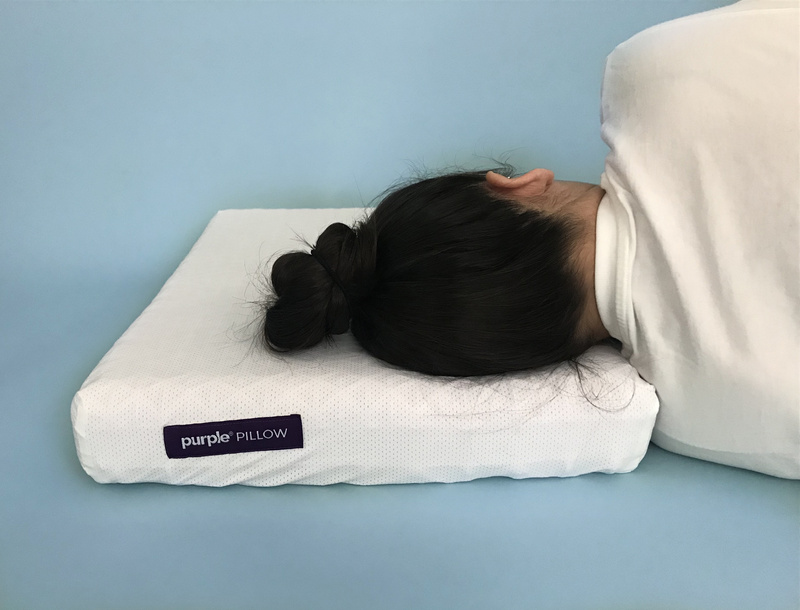 The Purple pillow is made entirely of their Purple polymer which is arranged in a head-specific Smart Comfort Grid™, perfect for cradling your head all night long. The Purple Polymer can also be found in the top layer of the Purple mattress which is optimized for pressure relieving comfort. The pillow cover is an artificial blend that is stretchy, soft, and won’t trap heat. It has the feel of mesh athletic attire and will stretch and bend with the pillow as it moves. The smell of the Purple pillow is extreme. Like diesel fuel. It was so overpowering even after a few weeks of airing it out, the smell did not let up. Although, it has a innovative grid design and uniquely comfortable feel the smell was too overpowering. The Smart Comfort Grid™ is specially designed to provide perfect support for you head and neck. When resting on the Purple pillow it really feels like it is holding your head in place. 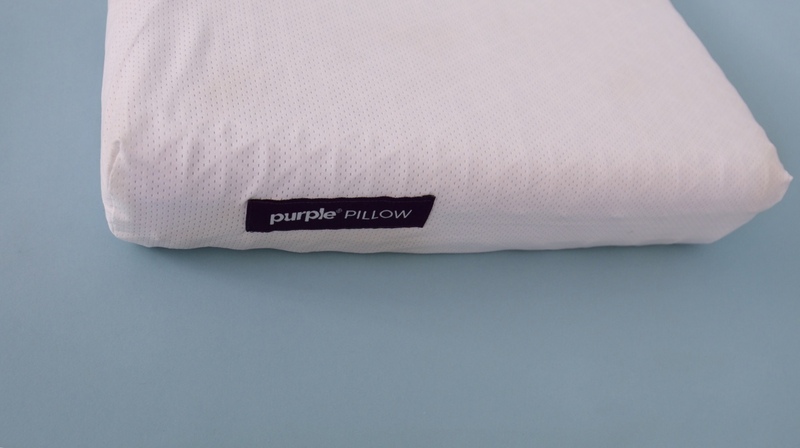 The Purple pillow short, at only 3 inches in height its not so ideal for side sleeping unless your mattress is super soft. Back and stomach sleepers would better suited on the Purple pillow. The Purple polymer is super flexible. 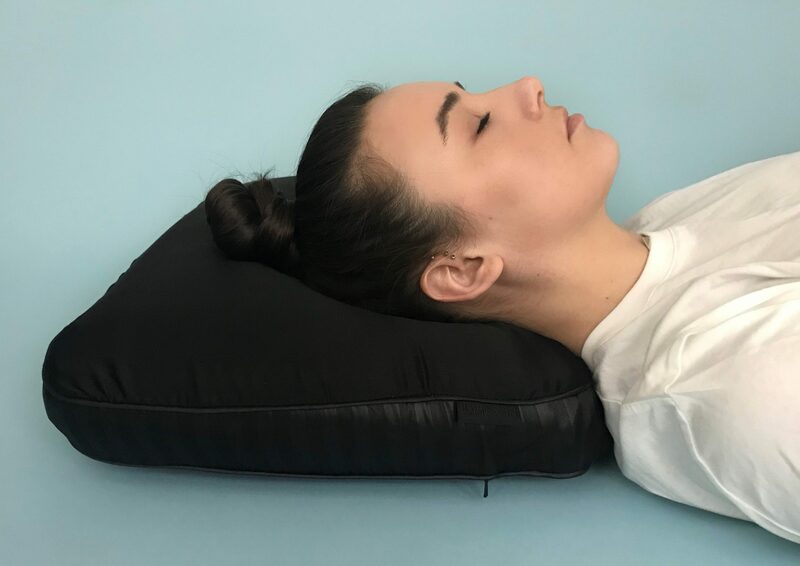 The 10 pound weight was placed in the center of the pillow the Smart Comfort Grid™ evenly distributes the weight without bottoming-out the rest of the pillow. 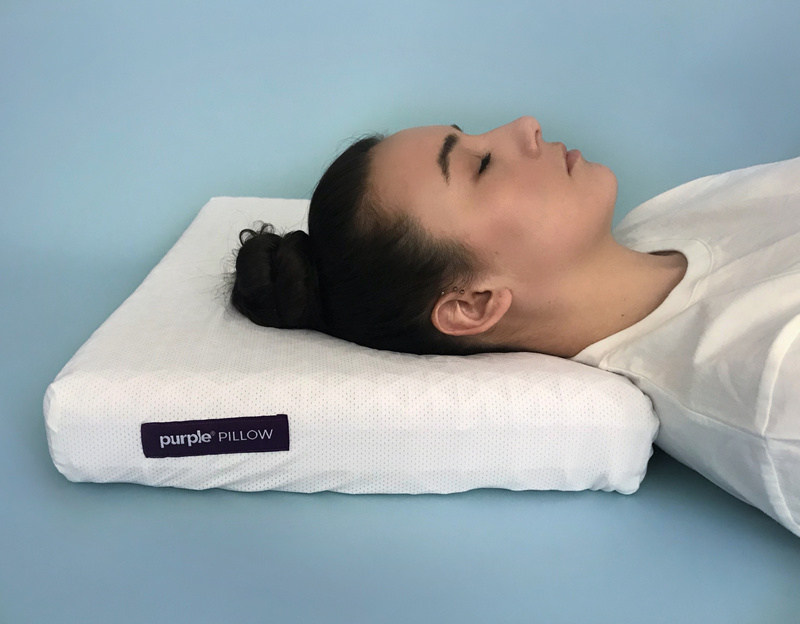 The Purple pillow is definitely a high-performance pillow that was designed to perfectly support your head during sleep, the only oversight is the powerful smell of the Purple polymer. Even though the Smart Comfort Grid™ has air channels running through the plastic polymer does trap heat. After the hand was removed the highest recorded pillow temperature was 88° which dropped to 79°. For the infrared test a hand was placed on the Purple pillow for one minute and off for one minute. The Purple pillow Smart-Grid technology is thoughtfully engineered. Though, the smell of the plastic polymer was too overpowering to sleep on. 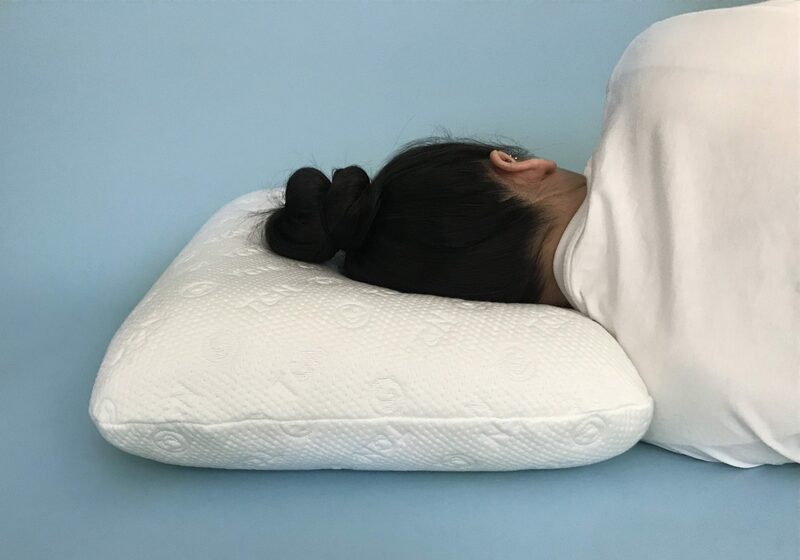 If you can get past the smell, this pillow may be a good match if you like a flat, but supportive pillow. Copyright © The Pillow Guide. 2018. All Rights Reserved.